This Friday, we will be hosting a Meet & Greet with the Soulshine Cannabis team! We already know how much you all love this company, your feedback is why we started carrying their line of products. Before we placed our first order with Soulshine Cannabis, we had numerous customers telling us how much they loved their Narnia, Klingon, Ewok, and other products. After so many people gave us passionate reviews about Soulshine, we did some research and found out how great their business is. Not only does Soulshine produce incredible marijuana products, but they are also environmentally conscious and donate a portion of all retail sales to supporting homeless and neglected animals. 20% Off All Soulshine Cannabis Products on 10/05/18! 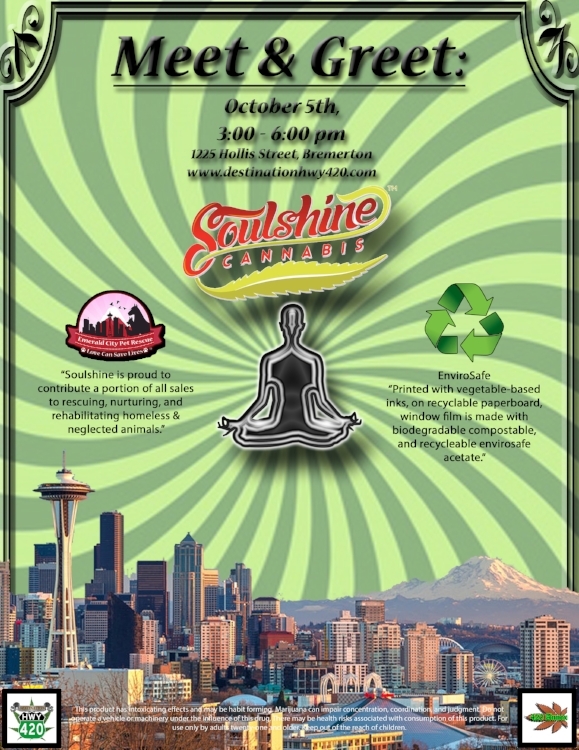 Soulshine Cannabis is an environmentally conscious top shelf marijuana producer/processor located in Renton, WA. Soulshine will be at Destination HWY 420 this Friday for a Meet & Greet. Come on down and meet the Soulshine team and pick up some of their products for super low prices. When purchasing Soulshine Cannabis products, one of the first things you’ll notice are the beautiful aesthetics of each bud. Soulshine flower is precisely trimmed and hand selected to ensure only top-quality buds are provided to the consumers. The next thing you’ll likely notice about Soulshine products is their unique, well-designed, and environmentally conscious packaging. Soulshine packaging is made with EnviroSafe materials that are biodegradable, compostable, and recyclable. The Soulshine team is steadfast in their core values of producing the best cannabis imaginable; this being made possible by hand-watering, hand-trimming, and by using only organic pesticides. All the care and attention given to each plant enables each cultivar’s genetic expression to fully develop. Narnia, an 80/20 Sativa, is a very distinguished cannabis cultivar. Narnia is a cross of Trainwreck and Jack with a terpene profile made up of mostly ocimene, pinene, and limonene which gives it a super smooth, sweet, pine, and citrus flavor. Narnia is physically uplifting and stimulates the mind with a surge of creative thought, and may give you the giggles. Narnia is a marijuana strain so incredible that someone should make a movie about it! Soulshine is an all-around amazing cannabis producer/processor with a big heart and beautiful buds. If you’d like to learn more about this company or pick up some of their products at discounted prices, come see us this Friday. Soulshine Cannabis produces some incredible marijuana products such as flower, pre-rolled joints, and concentrates. Narnia, Mandarin Cookies, and Klingon are some of our customer’s favorite products. Come see us this Friday for a Meet & Greet with the Soulshine team.